It’s been a busy week. 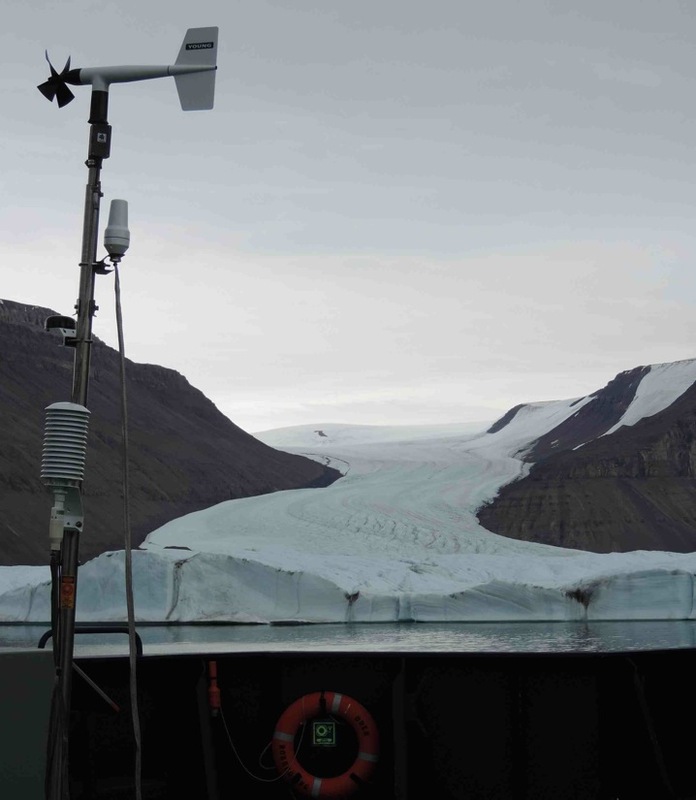 The events that transpired during and since the initial installation of the weather station on Petermann Glacier gave us some ups and some downs (therein the roller coaster). I’ve shared below (in italics) some of the emails that document the saga as it unfolded. 3. 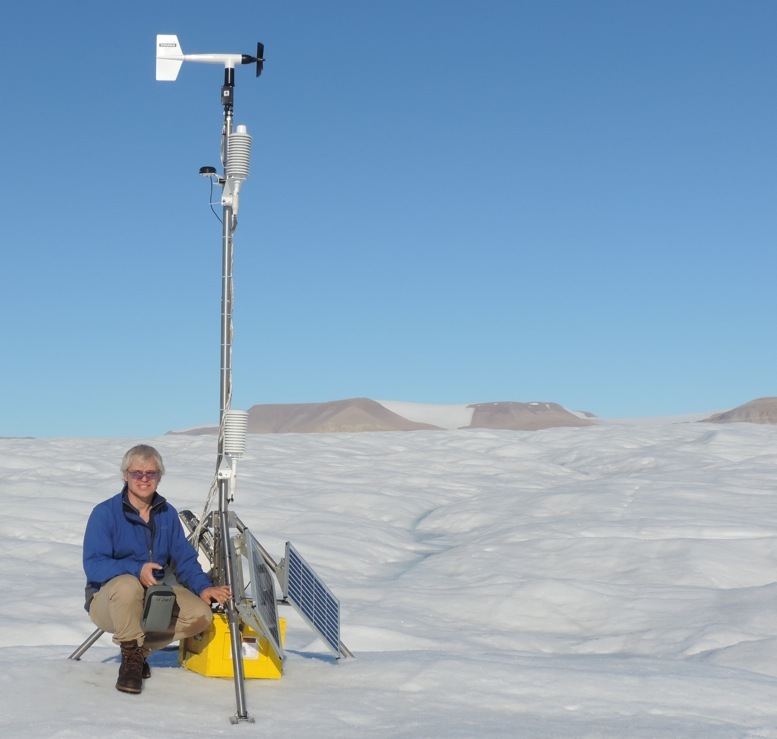 Deploy the Udel weather station prior to the ice shelf drilling (I did this). Less glamorous, I spent most of the day in packing and moving boxes while two helicopters were buzzing overhead coming and going as the first drill site was moved to a second drill site. At the end of the day, however, our weather station went up. 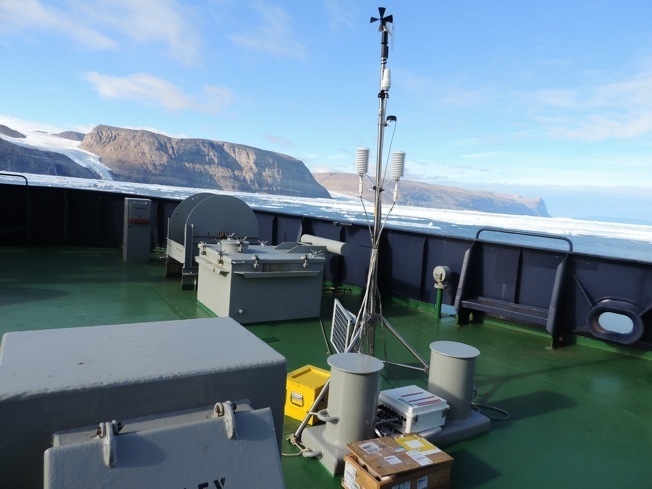 It was not a pretty job as we had only an hour left before we had to be back on the ship, but the weather station is now sited and returns data on a regular schedule. It does work. Helicopter transport of instruments via sling load. Here is a picture that shows the station’s current installation at site-3 which is temporary as Andreas will modify the mounting design after 5 ocean sensors are attached to it early next week. The shown design would not survive strong winter winds and excessive surface melting in the summer. University of Delaware automated weather station on Petermann Gletscher (view to north-east). On Tuesday, our spirits were somewhat crushed when Andreas informed us that he had heard nothing from the station for 5 hours. As it was scheduled to automatically send data on an hourly basis, this was somewhat disappointing. Both Andreas (from the ship) and I (at home) attempted to manually connect to the station. Neither of us was successful. We all waited somewhat impatiently to hear from the station. Andreas was hopeful that he could get back to the site in order to diagnose and repair any problems that had arisen. This morning (Thursday) I woke up to the following delightful email from Andreas. The subject line is Greeland Weather Station Working!!! I am ecstatic to report that our weather station on Petermann Gletscher is alive collecting and reporting data. The earlier shut-down, 8-hours after deployment on Aug.-10, was caused by Iridium satellite transmissions, not the set-up of hardware or software of the weather station itself. I attach a plot of the data collected so far that is being used by the ship’s operators to prepare and plan for flight operations over the glacier. There will be a massive increase in helicopter flying, because on Saturday the CBS 60-Minute team will arrive via helicopter from Qaanaaq, Greenland about 250 miles to the south. The five ocean sensors are NOT yet plugged into the UDel observing system, because ice-drilling operations at that site will not start until Monday or Tuesday. Our graduate student Peter Washam is on the glacier right now. The so-called Ice-Shelf team just completed a second drill hole near the grounding line of Petermann Gletscher where ice and water are expected to be as thick as the Empire State Building is tall. The picture shows Peter at that (second) drill site shortly after the camp there was established there Monday. The weather station was set-up about 13 km seaward at what will become the third drill site. Hopefully he did not forget to re-program the ocean sensors to move bits and bytes along the 600 m long serial cable (4800 baud) at a slower rate than we used them in an calibration test lowering them from the ship to the 600 m deep bottom of the ocean near Petermann Fjord. Drill Site-2 near the grounding zone of Petermann Gletscher. A small meltwater canyon on the right discharges into a lake behind the camp. The hot water drilling winch is visible on the upper left. The 2 1/2 day long time series (link above) shows air temperature about 0.5 and 2.0 m above the ice as well as wind speed and direction as well as atmospheric pressure. 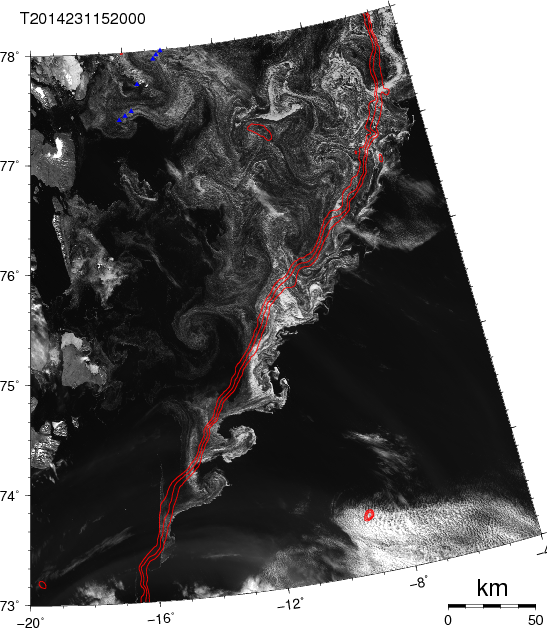 A GPS unit shows that the station is drifting about 3 m per day towards the ocean as is expected for this fast moving glacier moving about 1.2 km per year. My spirits are high after several days of anxious anticipation and waiting for a call from the weather station. Wish us luck. 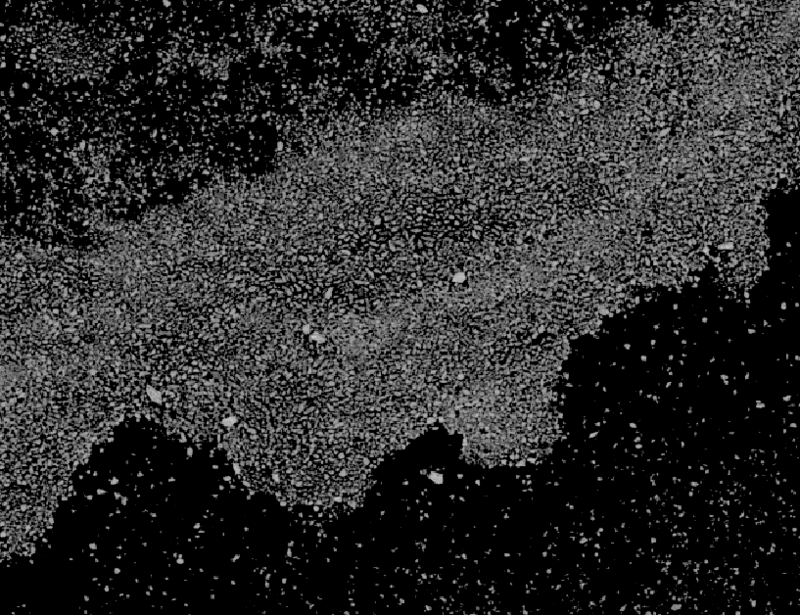 Since the iridium system is designed to gather data until it can be successfully transmitted, short periods of communication black-outs are not expected to be a problem. The data storage is limited, so we are hopeful that the communication failure was temporary and any future lapses will be equally short-lived. We soon should have have ocean data of salinity and temperature conditions under the glacier when the additional instruments have been lowered through the ice next week. That will be the story of our next post. Field research can be described as exciting, challenging and demanding. The work, especially when undertaken in the Arctic, has proven to be all of these to me. Planning ahead is an important part of the task. Since we are so far removed from things like high speed internet connections and hardware stores, we try to be as prepared as possible with redundant equipment, any computer data file and programs we anticipate that we might need, a set of backup plans for foreseeable contingencies and a toolbox full of gizmos and gadgets which might come in handy to solve the inevitable complications that will arise. It seems to me that the most important skills for an Arctic researcher are perseverance, an inclination to be very creative and a good sense of humor. The scenery, however, can be breathtaking. This summer, I’m the stay-at-home scientist. Whilst my advisor Andreas and my fellow graduate student Peter are working in Petermann Fjord, I’m home and am attempting to help as much as I can from here. This assistance has included installing a satellite communication system here and testing these systems that we’ll be using to transmit data about ocean conditions under a glacier and atmospheric conditions above it to us in Delaware for as long as we can. In accomplishing this project, the phrase, “it takes a village” comes to mind. Weeks ago, David Huntley of the Delaware Environmental Observing System (DEOS) at the University of Delaware configured the meteorologic station that will be the communications hub for all our data. He also trained us on installation. This hardware was packed up and transported to a ship, the Oden, in Sweden to be carried aboard for this summer’s research cruise to Petermann Fjord. Last week, on the Oden in the Arctic, Andreas configured the data gathering and transmission equipment, utilizing creative wiring techniques to allow regular transmission of data via satellite communications systems. Unfortunately there are no cell towers here either so satellite phones are being used to send the data. At home, I installed hardware to receive the data. Throughout this process, Kevin Brinson, Director of DEOS, used his experience to provide consultation and guidance on all of this, including acting as a liaison with high-tech equipment manufacturers. After several days of work to implement this near-real-time monitoring system to measure conditions and transmit those measurements within hours of their capture, we have a working system! The exhilaration we all felt upon the first successful connection and seeing information like the ambient temperature and barometric pressure at Petermann Fjord (measured less than an hour before I got it) made all that work worthwhile. 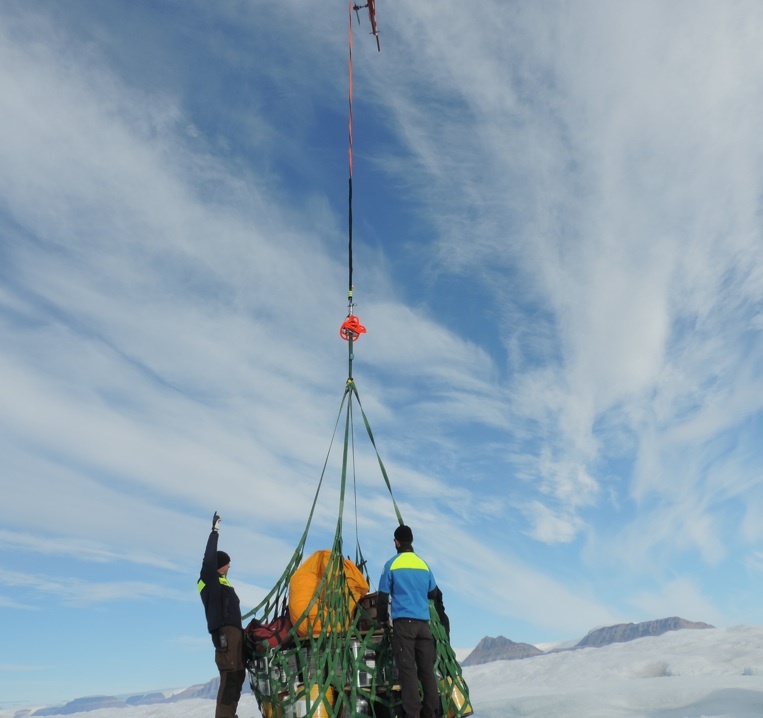 Upon installation of the monitoring station on the surface of the glacier and drilling through the ice to place ocean measurement instruments, we should have a system that can give us this and much more information for an extended deployment – perhaps several years – and return that data every day. The last time we installed this kind of ocean monitoring instruments, they measured for 3 years and required us to to return via ship to recover the instruments before we got any data. How long these instruments will collect data is dependent on a number of factors. Conditions in the Arctic can be rather rough on electronics. Temperatures dip below -40 degrees (either Celsius or Fahrenheit) and polar bears are very inquisitive creatures – wires seem to attract their curiosity. The ice upon which our equipment will rest has been melting. 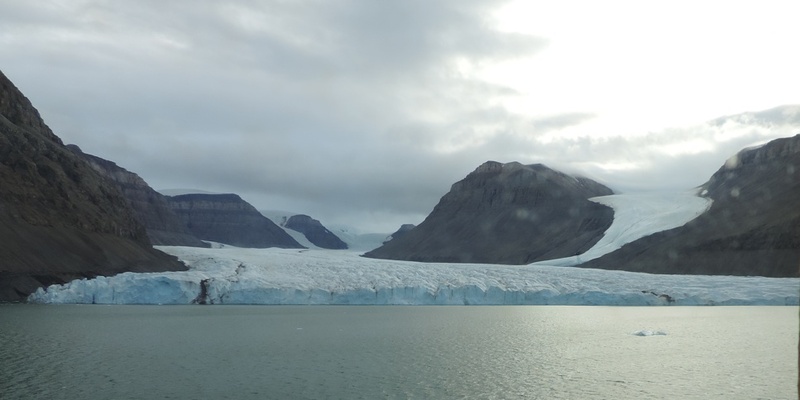 Eventually, this glacier will calve and the location of our monitoring station is likely to be impacted by melting and/or calving (or breaking off) of the glacier. Our equipment is battery powered with solar charging supplements when there is sunlight. We hope that our batteries will be able to give us data throughout the long Arctic night that will last for months until sunrise (when solar charging begins again) in the spring. Meterologic station aboard the Oden. Meterologic station aboard the ship. The ice of Greenland in the background. Tomorrow, Andreas and Peter will be venturing out to the ice in the first steps of installing all this hardware. We are very excited about the prospect of seeing the results of many months worth of planning and work. As the project continues Andreas and Peter will keep us up to date on their progress.